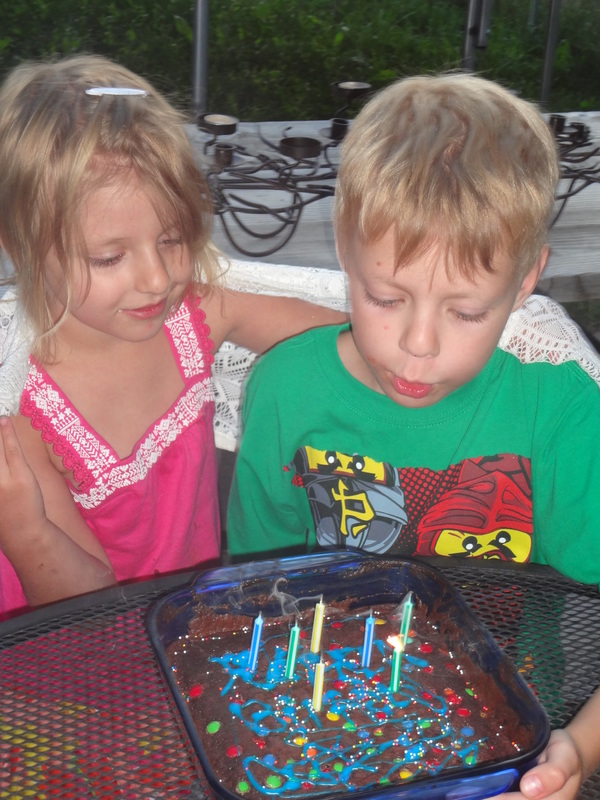 My son just had his 7th Birthday on July 11th. Even though he enjoyed his gifts from everyone, he loved having his friends and family around more. He reminded me how important relationships are. He is social and he appreciates others. He gives and receives well. This is how God has designed us. He has called us to reach out and be in community. So how do we create long lasting relationships? We need to be intentional and willing to live life together. It’s important to be intentional with our friends. On my son’s birthday he wanted two of his best friends to meet. Jayden is a friend that he has known since they were four months old. He met his friend Jake over a year ago. When Jake’s mom and I met we decided to get the boys together once a week for homeschooling. During the party the boys created volcanoes, climbed trees and acted silly. Just like boys should. Justin was thrilled. As I reflect back on Justin’s Birthday, I can’t help but give God praise for bringing us all together. God brings people together all the time and if we want to be involved, we need to be intentional about staying connected. My son has a strong bond with these two boys. I sincerely enjoy my two mom friends as well. All three of us have been intentional about staying connected. Justin loved his Birthday gifts. But he loved having his friends over even more. Friendship is a real gift. We all want to be celebrated and we should take time out to do so. Nanna comes every year from Texas to celebrate my kids Birthdays. The kids help me prepare her bedroom down in the basement. On the day she arrives they all go to the airport with Daddy to pick her up. When they bring her home they help her unpack and visit with her for hours. My son loves Nanna’s cinnamon toast and just about every morning while she is here our house smells yummy. It’s a Great way to wake up! When it’s time for her to go home we all take her to the airport. My kids have great Grandparents who cherish their Grandchildren. My mom has us over every Sunday and she serves Justin’s favorite macaroni and cheese. She makes them feel important by treating them with a special new bowl, place mat, and cookie, cup of chocolate, ice cream, or tiny play toy. She celebrates the moments she has with them. Their Mimmi and Papaw from Texas come with smiles, giggles, and love. Sometimes when they visit they bring breakfast. My kids wake up early, sit by the window and wait eagerly. Not because they are hungry. But because they want to celebrate life with the ones who shower them with hugs, praise, and kisses. Justin stands tall with a heart filled with memories. He knows that he is loved. It’s important that my kids learn to celebrate those they care about by making time for others. By planning, organizing and preparing. And they do! We need to be there for others. Just recently my kid’s friend broke her arm in gymnastics. She had to spend a couple of nights in the hospital to recover from surgery. My kids were very upset and immediately they wanted to drop all of our family fun plans and take her a gift. When we arrived at the hospital she asked my kids to sit with her, hold her hand, and hug her. And I was deeply moved as I watched them bond. This is how we live together and stay together. We make time for each other. Hi Susannah! Thanks for coming by. My two little kids are so outgoing. When we go places they talk to everyone. I’ve never been like that. I feel like having kids has brought me out of my shell. I’m much friendlier now. Such a sweet post my sister….. I love point number 1 – Be intentional. Thanks for coming by. Living life on purpose!!! Totally agree, I know there are areas/relationships I need to be more intentional about. So many people get so busy with their own lives that we don’t always take that time out to connect and reach out to others like we should. Very important life lessons! Hi Shannon, thanks for coming by. We do live in a time where life happens fast. We have so much entertainment, places to see new things, and jobs to do. Writing real letters and talking on the phone doesn’t really happen anymore. We text, email, and write on facebook. It’s all good stuff of course. But to go and visit someone at the park takes planning. I feel like we live in a time where we are busy trying to be the best at something instead of being a friend. I feel like I need to take time out from life to be intentional. Have a blessed day and thanks for taking time out to comment. With all the billions of blogs out there, I always feel blessed when others pause for a moment and visit with me. Thank you for sharing! Yes this is absolutely true. We need to be intentional about loving and appreciating each other. Lord knows, we can all get too busy, but people matter! And everyone around us should know they’re loved. Thanks Maria for coming by and Yes People Matter and people need to know that they are loved. Nicely said. Don’t you love it when we find these little lessons in everyday life? Hi Rebekah – I learn so much from my kids. Thank you for coming over today. As I get older, maintaining contact with my closest friends takes more work. People get married, have their own families, move away…and the relationships can begin to crack. Luckily, I am part of a group of girlfriends that puts real effort into staying connected. I couldn’t be more thankful! Even though we are scattered all over the country, when we get together, it’s as if time stood still! I also have a great group of girlfriends and everyone in this group is intentional. We have been connected for almost seven years. It’s through emails, sharing on facebook, setting up a playdate, getting everyone together for a dinner date, its texting to see if you want to sit together at church, it’s the phone call, it’s the taking a meal over, setting a monthly coffee date, it’s showing up for one another, All these efforts from everyone of us makes connection stay alive. And honestly – i love when my friends initiate and pursue me. I don’t always want to be the only one responsible for keeping friendships alive. I do though with some friends. And some I never hear from if I don’t engage. I think it is so important for all to show an interest in the other and not sit around and expect others to create a get together. Thanks so much Laura for hanging out today. made myself a promise I would intentionally be a part of their lives. No matter how far away I live or how crazy work gets, I want them to grow up having special and fond memories of our times together. They will be young for such a short time, I don’t want to miss a minute.